The frescoes in the Chapel of the White Penitents in the perched village of La Tour were painted in 1492 by Guirard Nadal and Currand Bravesi, two of the so-called peintres primitifs niçois (primitive painters of Nice) who are only known from this chapel. 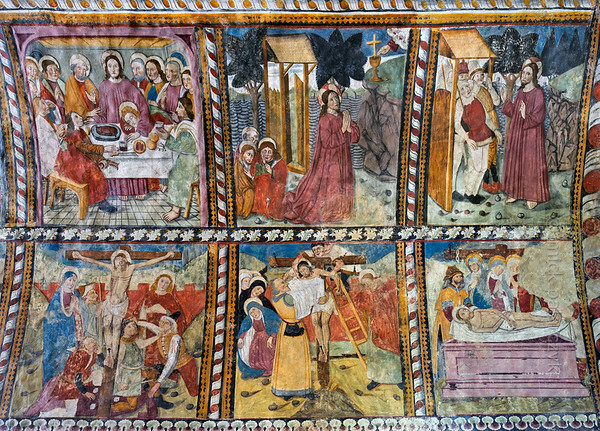 The sidewalls are covered with twenty panels in vibrant colours, depicting the Passion of Christ, while the ceiling shows God in Majesty within a purple mandorla. The altar wall is reserved for the Last Judgment with St. Peter herding the righteous to Heaven's door, while the damned are tortured by a group of devils worthy of Hieronymus Bosch. 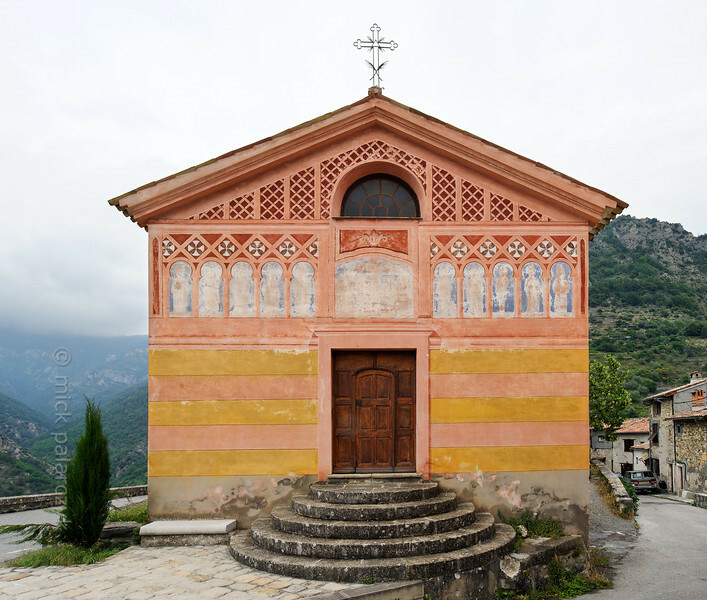 [FRANCE.ALPSSOUTH 29077] ’Exterior of Chapelle des Pénitents Blancs in La tour sur Tinée.’ The Chapelle des Pénitents Blancs (chapel of the Confraternity of White Penitents) is located in the village of La Tour sur Tinée in the French Alps, 30 km north of Nice. Photo Mick Palarczyk. [FRANCE.ALPSSOUTH 29079] ’Frescoes in Chapelle des Pénitents Blancs in La tour sur Tinée.’ In the Chapelle des Pénitents Blancs at La Tour the Passion of Christ is depicted in twenty colourful panels. Here we see the Last Supper (panel no 3), the Garden of Gethsemane (no 4), soldiers entering the Garden of Gethsemane (no 5), the crucifixion (no 13), the deposition (no 14) and entombment of Jesus (no 15). 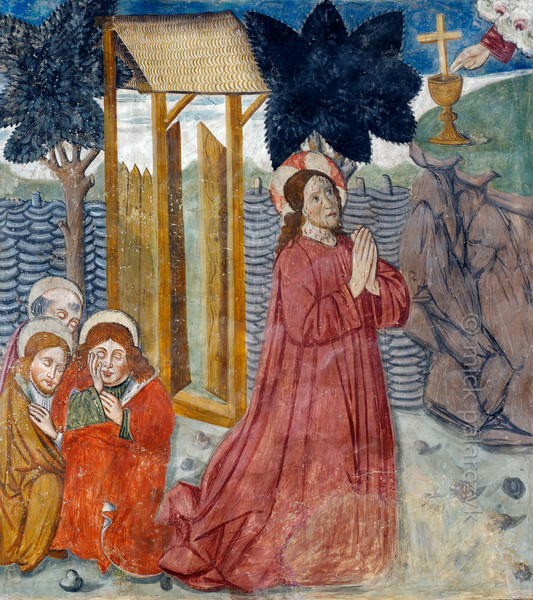 The frescoes were executed in 1492 on the chapel's left wall by Currand Bravesi and Guirard Nadal, two of the so-called 'peintres primitifs niçois' (primitive painters of Nice). La Tour sur Tinée is a village in the French Alps, 30 km north of Nice. Photo Mick Palarczyk. [FRANCE.ALPSSOUTH 29081] ’Garden of Gethsemane.’ The fourth of twenty panels depicting the Passion of Christ in the Chapelle des Pénitents Blancs at La Tour shows Jesus praying for strength in the Garden of Gethsemane while his disciples are fast asleep. The fresco was executed in 1492 on the chapel's left wall by Currand Bravesi and Guirard Nadal, two of the so-called 'peintres primitifs niçois' (primitive painters of Nice). La Tour sur Tinée is a village in the French Alps, 30 km north of Nice. Photo Mick Palarczyk. 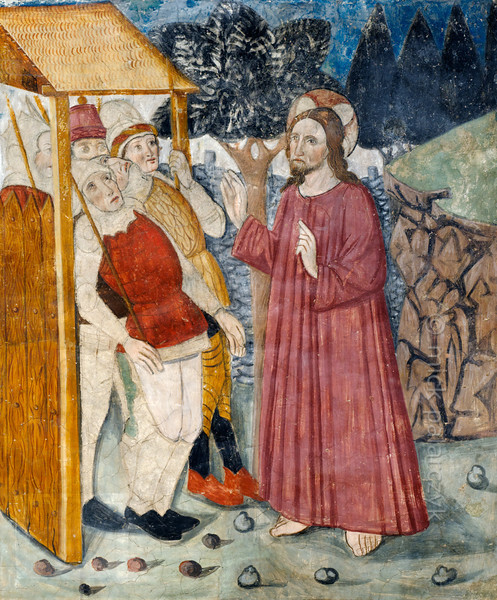 [FRANCE.ALPSSOUTH 29083] ’Soldiers in Garden of Gethsemane.’ The fifth of twenty panels depicting the Passion of Christ in the Chapelle des Pénitents Blancs at La Tour shows Roman soldiers entering the gate of the Garden of Gethsemane (detail). Although intending to arrest him, they seem a bit taken aback by the presence of Jesus. The fresco was executed in 1492 on the chapel's left wall by Currand Bravesi and Guirard Nadal, two of the so-called 'peintres primitifs niçois' (primitive painters of Nice). The painters seem to have left part of the soldiers' garments in an unfinished state. La Tour sur Tinée is a village in the French Alps, 30 km north of Nice. Photo Mick Palarczyk. 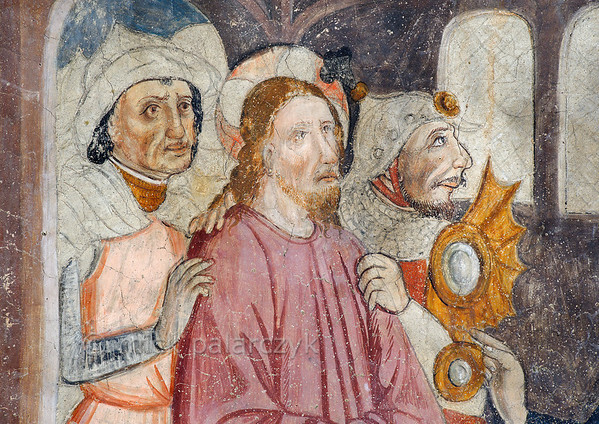 [FRANCE.ALPSSOUTH 29085] ’Jesus led by two soldiers.’ The seventh of twenty panels depicting the Passion of Christ in the Chapelle des Pénitents Blancs at La Tour shows Jesus being led by soldiers to the high priest Caiaphas (detail). The fresco was executed in 1492 on the chapel's right wall by Currand Bravesi and Guirard Nadal, two of the so-called 'peintres primitifs niçois' (primitive painters of Nice). The painters seem to have left part of the soldiers' garments in an unfinished state. La Tour sur Tinée is a village in the French Alps, 30 km north of Nice. Photo Mick Palarczyk. 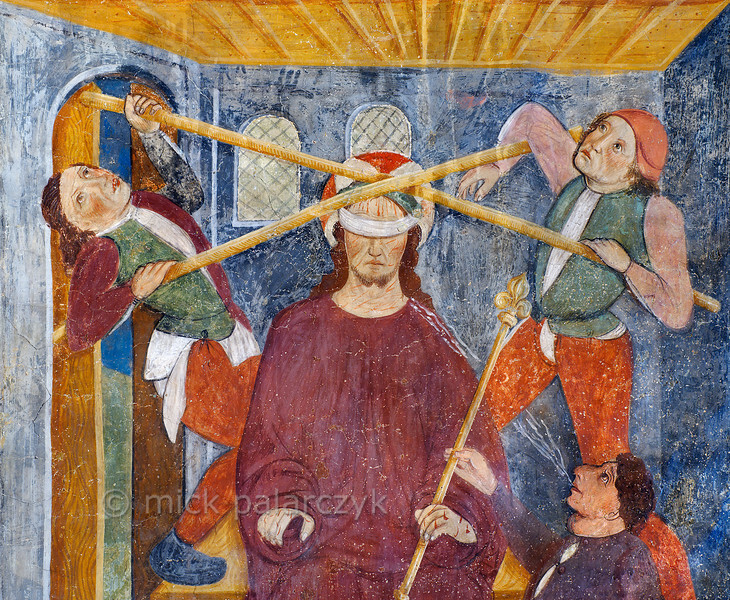 [FRANCE.ALPSSOUTH 29087] ’Derision of Christ.’ The ninth of twenty panels depicting the Passion of Christ in the Chapelle des Pénitents Blancs at La Tour shows the derision of a blindfolded Jesus (detail). He is spat at and two men use canes to press the crown of thorns on his head (the crown itself is not visible, though). The fresco was executed in 1492 on the chapel's right wall by Currand Bravesi and Guirard Nadal, two of the so-called 'peintres primitifs niçois' (primitive painters of Nice). La Tour sur Tinée is a village in the French Alps, 30 km north of Nice. Photo Mick Palarczyk. [FRANCE.ALPSSOUTH 29089] ’Jesus before Pontius Pilate.’ The tenth of twenty panels depicting the Passion of Christ in the Chapelle des Pénitents Blancs at La Tour shows Jesus brought before Pontius Pilate (detail). The fresco was executed in 1492 on the chapel's right wall by Currand Bravesi and Guirard Nadal, two of the so-called 'peintres primitifs niçois' (primitive painters of Nice). La Tour sur Tinée is a village in the French Alps, 30 km north of Nice. Photo Mick Palarczyk. 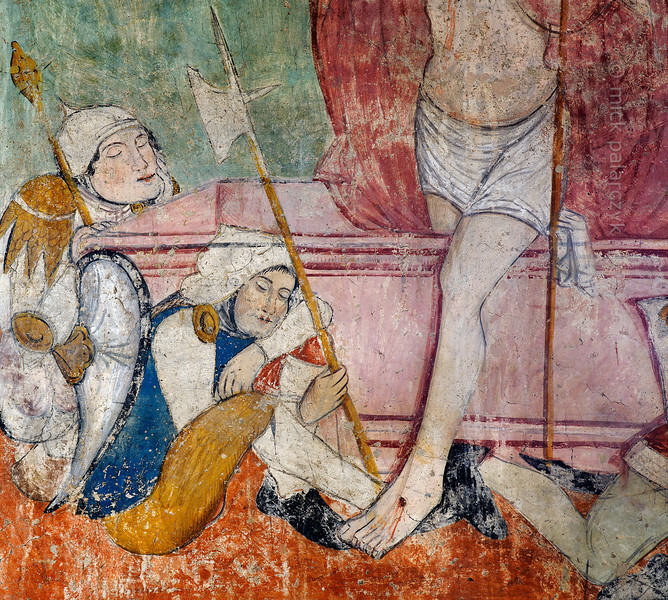 [FRANCE.ALPSSOUTH 29091] ’Sleeping Roman soldiers.’ The seventeenth of twenty panels depicting the Passion of Christ in the Chapelle des Pénitents Blancs at La Tour shows his resurrection, with sleeping Roman soldiers guarding the tomb (detail). The fresco was executed in 1492 on the chapel's right wall by Currand Bravesi and Guirard Nadal, two of the so-called 'peintres primitifs niçois' (primitive painters of Nice). La Tour sur Tinée is a village in the French Alps, 30 km north of Nice. Photo Mick Palarczyk. 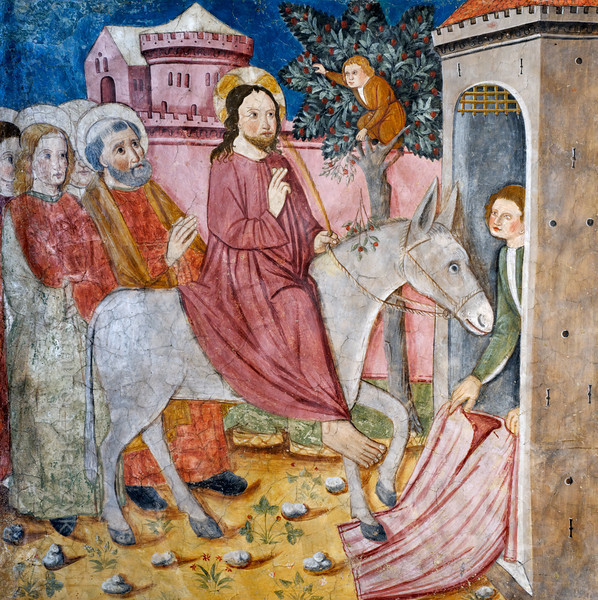 [FRANCE.ALPSSOUTH 29078] ’Arrival in Jerusalem.’ The first of twenty panels depicting the Passion of Christ in the Chapelle des Pénitents Blancs at La Tour shows Jesus riding a donkey into Jerusalem on Palm Sunday. To honour him people spread their cloaks on the ground and also lay down branches of trees. The gospel of John specifically mentions palm fronds (hence Palm Sunday) but in northern climates substitutes like yew, willow or box were often depicted. 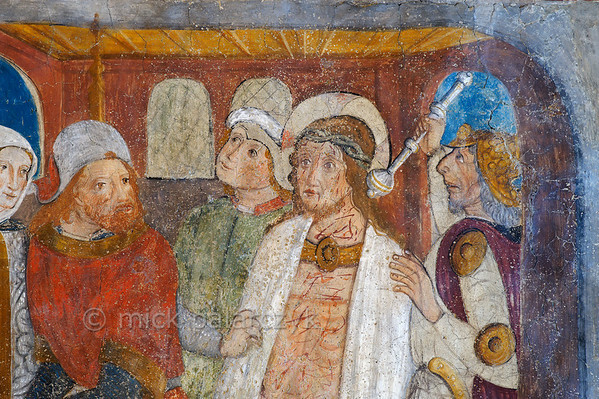 The fresco was executed in 1492 on the chapel's left wall by Currand Bravesi and Guirard Nadal, two of the so-called 'peintres primitifs niçois' (primitive painters of Nice). La Tour sur Tinée is a village in the French Alps, 30 km north of Nice. Photo Mick Palarczyk & Paul Smit. 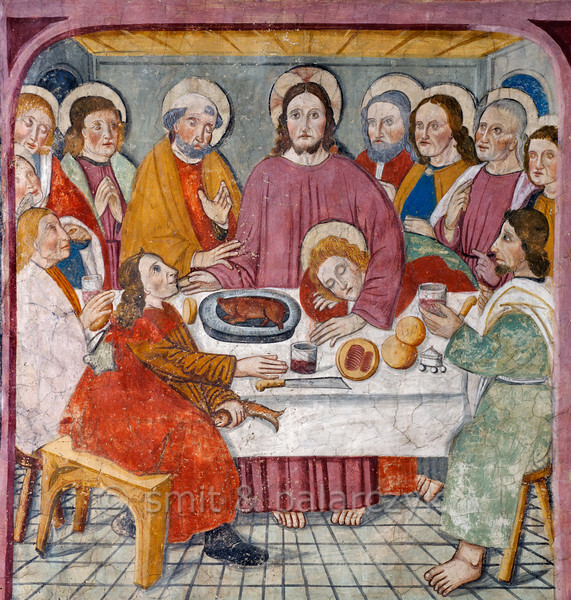 [FRANCE.ALPSSOUTH 29080] ’Last Supper.’ The third of twenty panels depicting the Passion of Christ in the Chapelle des Pénitents Blancs at La Tour shows Jesus and his disciples during the Last Supper. St. John is held in an awkward embrace that seems more appropriate for a wrestling match! The fresco was executed in 1492 on the chapel's left wall by Currand Bravesi and Guirard Nadal, two of the so-called 'peintres primitifs niçois' (primitive painters of Nice). La Tour sur Tinée is a village in the French Alps, 30 km north of Nice. Photo Mick Palarczyk & Paul Smit. [FRANCE.ALPSSOUTH 29082] ’Soldiers in Garden of Gethsemane.’ The fifth of twenty panels depicting the Passion of Christ in the Chapelle des Pénitents Blancs at La Tour shows Roman soldiers entering the gate of the Garden of Gethsemane. Although intending to arrest him, they seem a bit taken aback by the presence of Jesus. The fresco was executed in 1492 on the chapel's left wall by Currand Bravesi and Guirard Nadal, two of the so-called 'peintres primitifs niçois' (primitive painters of Nice). The painters seem to have left part of the soldiers' garments in an unfinished state. La Tour sur Tinée is a village in the French Alps, 30 km north of Nice. Photo Mick Palarczyk. [FRANCE.ALPSSOUTH 29084] ’Deposition of Christ.’ The fourteenth of twenty panels depicting the Passion of Christ in the Chapelle des Pénitents Blancs at La Tour shows the deposition of Jesus. The fresco was executed in 1492 on the chapel's left wall by Currand Bravesi and Guirard Nadal, two of the so-called 'peintres primitifs niçois' (primitive painters of Nice). La Tour sur Tinée is a village in the French Alps, 30 km north of Nice. Photo Mick Palarczyk. [FRANCE.ALPSSOUTH 29086] ’Derision of Christ.’ The ninth of twenty panels depicting the Passion of Christ in the Chapelle des Pénitents Blancs at La Tour shows the derision of a blindfolded Jesus. 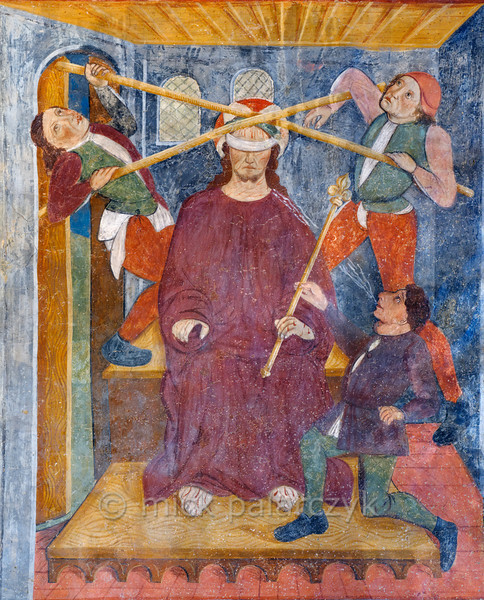 He is spat at and two men use canes to press the crown of thorns on his head (the crown itself is not visible, though). 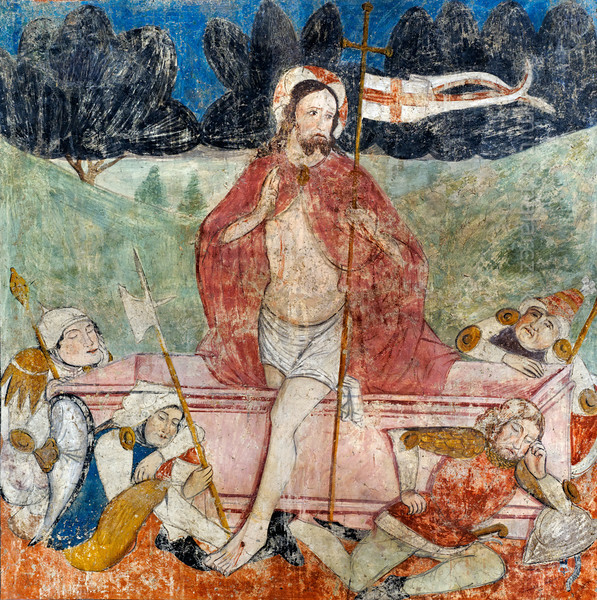 The fresco was executed in 1492 on the chapel's right wall by Currand Bravesi and Guirard Nadal, two of the so-called 'peintres primitifs niçois' (primitive painters of Nice). La Tour sur Tinée is a village in the French Alps, 30 km north of Nice. Photo Mick Palarczyk. [FRANCE.ALPSSOUTH 29088] ’Jesus before Pontius Pilate.’ The tenth of twenty panels depicting the Passion of Christ in the Chapelle des Pénitents Blancs at La Tour shows Jesus brought before Pontius Pilate. 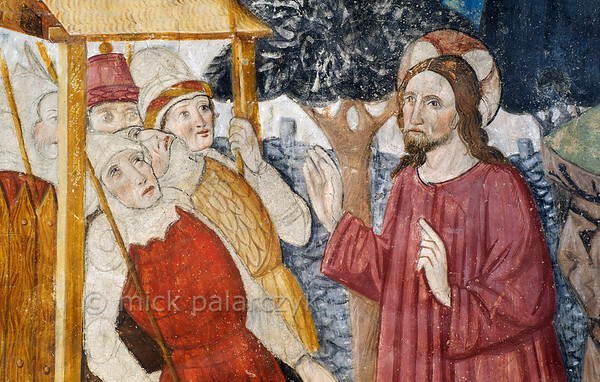 The Roman prefect washes his hands to show that he will not be responsible for the execution of Christ. The fresco was executed in 1492 on the chapel's right wall by Currand Bravesi and Guirard Nadal, two of the so-called 'peintres primitifs niçois' (primitive painters of Nice). La Tour sur Tinée is a village in the French Alps, 30 km north of Nice. Photo Mick Palarczyk. [FRANCE.ALPSSOUTH 29090] ’Resurrection.’ The seventeenth of twenty panels depicting the Passion of Christ in the Chapelle des Pénitents Blancs at La Tour shows his resurrection, with sleeping Roman soldiers guarding the tomb. The fresco was executed in 1492 on the chapel's right wall by Currand Bravesi and Guirard Nadal, two of the so-called 'peintres primitifs niçois' (primitive painters of Nice). La Tour sur Tinée is a village in the French Alps, 30 km north of Nice. Photo Mick Palarczyk & Paul Smit. 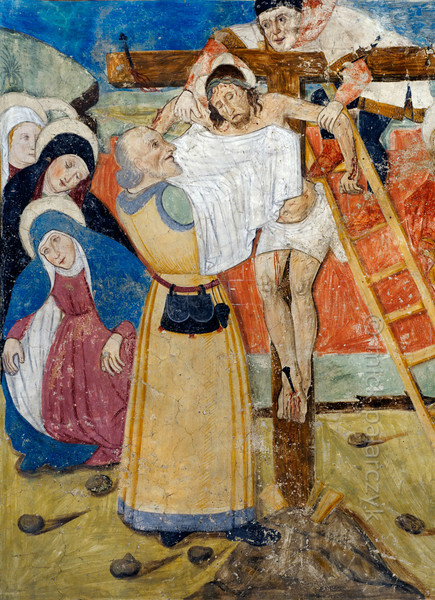 The tenth of twenty panels depicting the Passion of Christ in the Chapelle des Pénitents Blancs at La Tour shows Jesus brought before Pontius Pilate (detail). 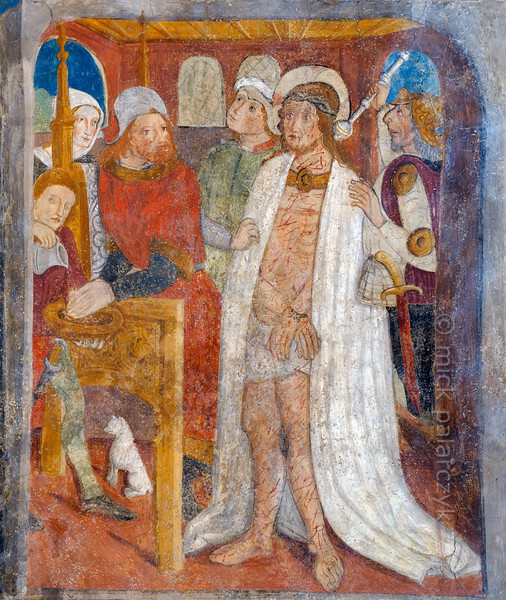 The fresco was executed in 1492 on the chapel's right wall by Currand Bravesi and Guirard Nadal, two of the so-called 'peintres primitifs niçois' (primitive painters of Nice). La Tour sur Tinée is a village in the French Alps, 30 km north of Nice. Photo Mick Palarczyk.